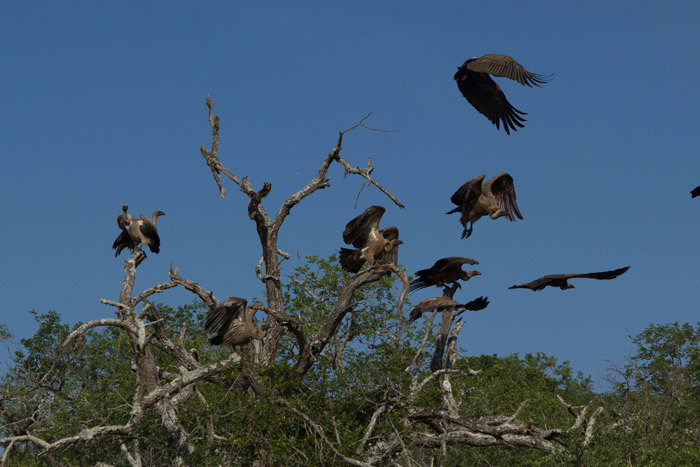 The trees were heavily laden with vultures, like balloons at a party. Everywhere we looked they stared down at us, eager eyes, menacing grins, perched ready and waiting. 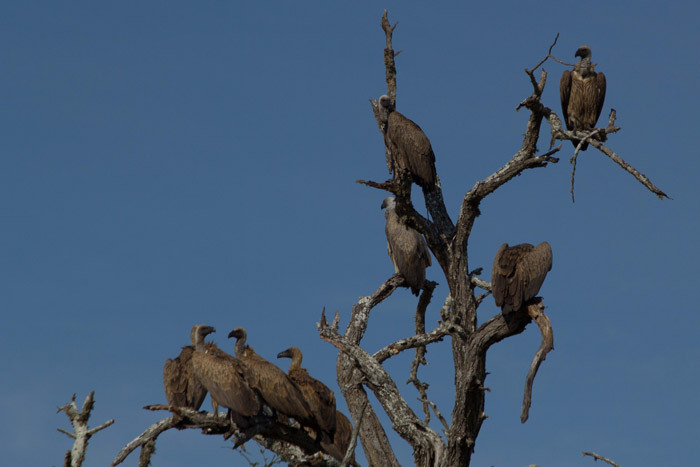 White-backed vultures crowded the low branches of the acacia tree, anticipating the feast that was soon to come. “There must be a kill around here somewhere guys, keep your eyes peeled,” I said as I glanced over my shoulder at a cruiser full of our wide eyed Rhino River Lodge guests. 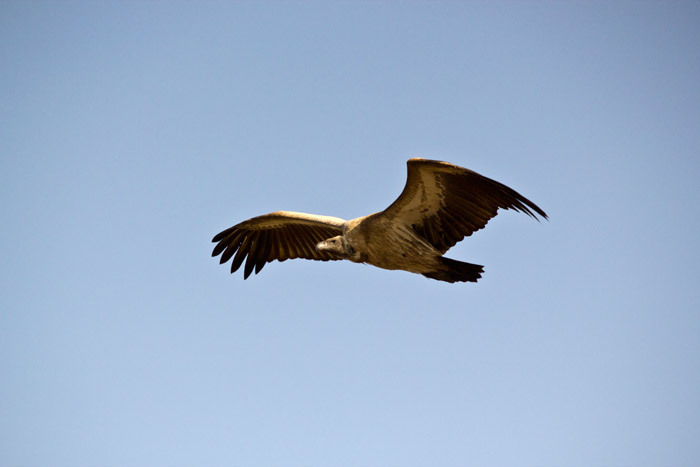 The ‘bush telegraph’ had spread far and wide and these large feathered scavengers were flocking in by the hordes. At a time like this, under cloudy skies you can’t help but hum the Jungle Books’ “we are friends till the bitter end” song which puts vultures in a sullen, grim reaper-type of stance. “There it is!” a guest shouted, waking me from my Disney daydream. I swung around to see cheetahs on a large impala carcass under a thick thorny bush. The cats were making good progress on their meal, but the tension between the vultures and the spotted cats was evident. 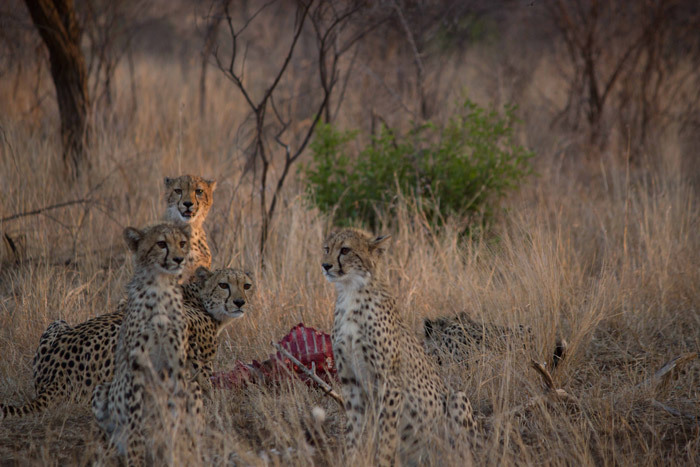 One cheetah would tuck into the meal whilst the others kept a watchful eye on the sharp beaked intruders, spitting and snarling at the enclosing beady-eyed vultures. 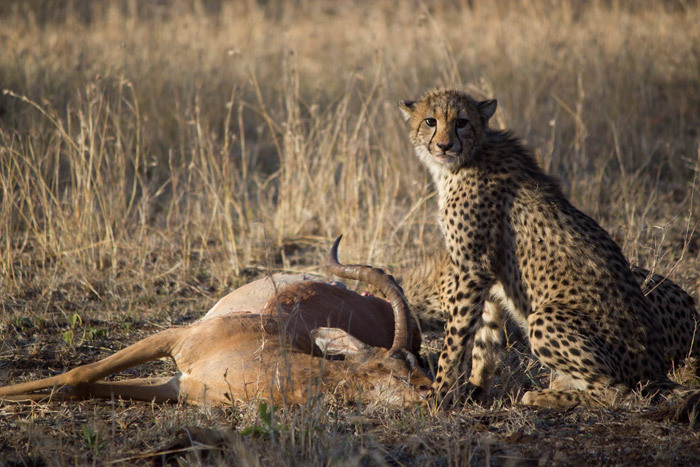 With a pregnant belly full of food, one of the cheetahs staggered away from the feeding frenzy and located a shady spot to let his meal settle. 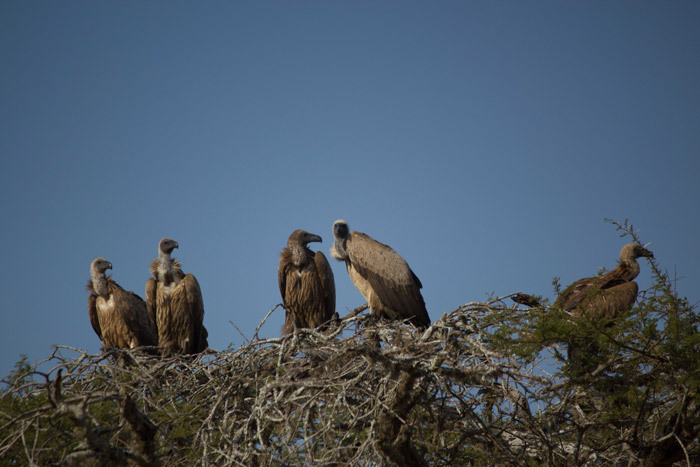 The vultures noted the security force was down one and they started to make their move. One by one they dropped from branches like a SWAT team onto the ground. They scuttled over the grassy plains like crabs, their wings stretched out in a theatrical display. The remaining cheetahs panicked as a sea of feathers came crashing towards them. 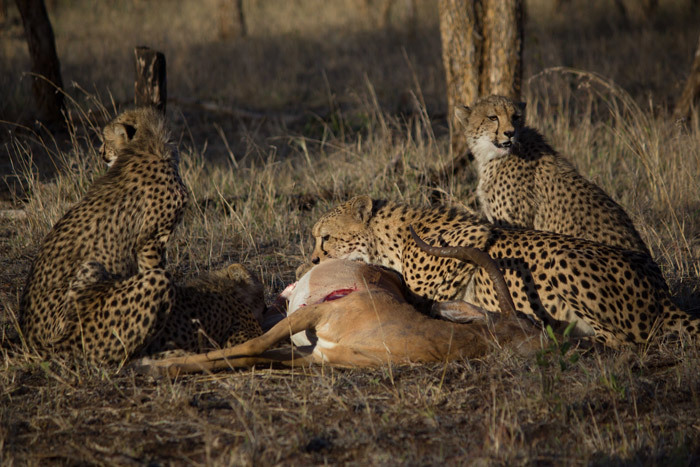 With a mouthful of meat the remaining cheetah leapt over the impala carcass and retreated to the safety of the shade. Within seconds the carcass was lost from sight as a pile of hungry scavengers battled for scraps. 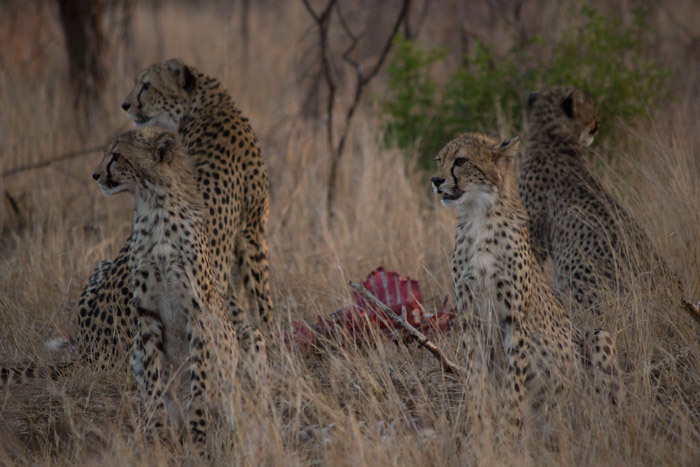 The cheetahs watched on from a distance as their hard earned meal was polished off right down to the bone. 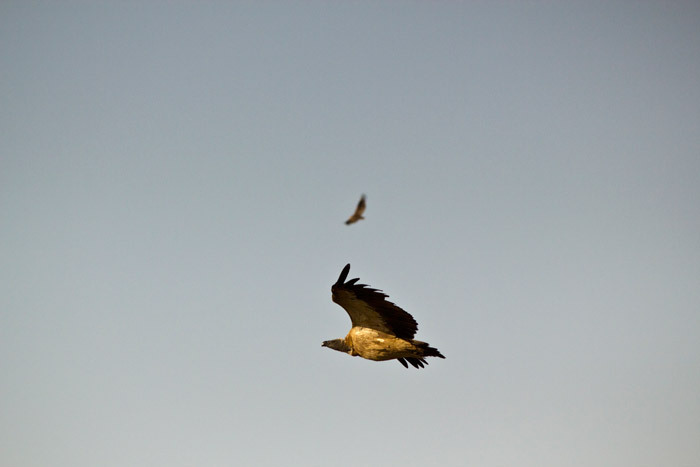 The vultures’ shouts and screams disturbed the peace and the area was no longer a place of rest for the cheetahs. The cats admitted defeat and slowly lumbered their bulging bellies to a more tranquil setting and left the birds to squabble over the remains.